The data analytics gurus over at Calcbench just published some numbers that SOX compliance and SEC reporting professionals might find interesting: a study of the gap between publishing an earnings release and filing the subsequent quarterly report. Calcbench reviewed the Form 8-K earnings releases and Form 10-Q quarterly reports from 3,399 companies that filed in second quarter 2016. The headline numbers are that companies took an average of 31.7 days to file their earnings release, and 35.7 days to file the quarterly report—which means a four-day delay between earnings release and quarterly filing. OK, that was easy. But when you look at the filing times for sub-groups within that larger population, several questions start to arise about the logic and strategy of when companies disclose financial information. Exhibit A: Those companies that took the least amount of time to announce earnings also had the longest time after announcement to file their quarterly report—12.9 more days. Generally speaking, the more time a company took to announce its earnings, the more quickly it followed up with its formal 10-Q filing to the Securities and Exchange Commission. Table 1, below, is what the data looks like for the first 40 days from quarter end. If that table is a bit confusing, look at the data again in chart format, extended out to 45 days after quarter end. The trend becomes much more visible. The sweet spot seems to be right around the sixth week after quarter end (that is, days 35 to 40). That’s when the time between earnings release and quarterly filing drops dramatically. 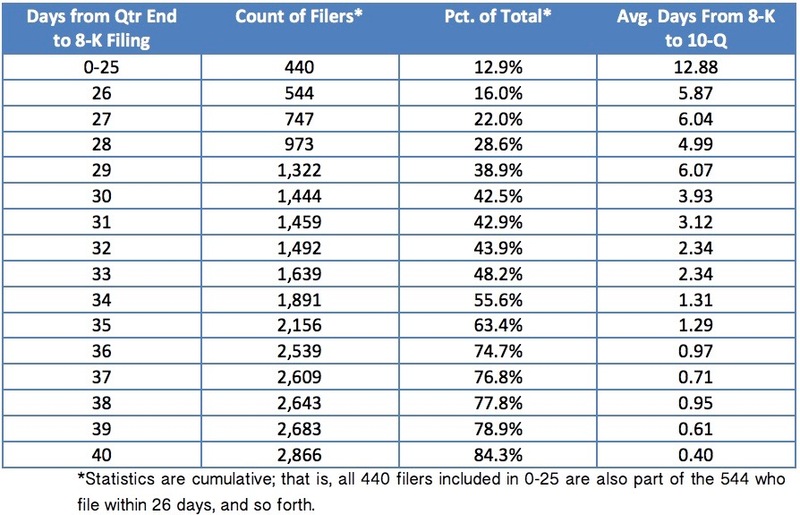 Meanwhile, those companies that file their earnings release early still need that average 12.9 days to file the 10-Q—which is almost the same time for companies waiting and filing both documents later. Again, we see that companies filing both the earnings release and the 10-Q tend to file around Day 35, which is in line with what our data above just said. All this data raises a few questions about Sarbanes-Oxley compliance. First, for those companies filing the earnings release early—where does that extra 12.9 days to file the quarterly report come from? My first thought is to wonder whether those companies have stronger financial controls (governed by Section 404 of Sarbanes-Oxley), but weaker disclosure controls (governed by Section 302 of Sarbanes-Oxley). That is, these companies can capture the basic numbers that go into the earnings report soon after quarter close, so they go ahead and file the Form 8-K. Then the disclosure controls for everything else that goes into the quarterly report take more time, hence the 12.9-day lag until the 10-Q arrives. I also wonder whether companies that take more time to compile their quarterly reports, and then file both documents together, employ a more unified approach to SOX controls overall. If you manage 404 and 302 controls through one central system, with one group providing unified oversight, the result would probably look like the numbers we see above. What I would really like to know, however, is what SOX compliance technology the early 8-K filers use compared to the “late but together” crowd. The more I study the challenges of SOX compliance, the more I become a disciple of running your SOX compliance effort via a cloud-based provider rather than some mammoth ERP software system installed on site. If you have a vendor that helps to automate your updates to your control matrix and documentation, rather than you rooting around your Oracle or SAP implementation for that last bit of data—that could explain some of the patterns here, too. And I’m sure investor relations professionals will find this data interesting; the less time you have between 8-K and 10-Q, the less time there is for something to go wrong and create all sorts of IR anxiety with your shareholders. Unfortunately the Calcbench data examines only a few variables for only one quarter. We need more context to draw conclusions, and hopefully we can get that from Calcbench in the future. But the questions even this small data delivery raises are worth contemplating, as you look at your own SOX compliance effort and try to wrangle more efficiency out of it.